AmericaPANIC: Picking Up the Pieces After the Republicans Wrecked America: And then George Bush's total and complete failure was secured. The most destructive president in the history of the United States. Good riddance. And then George Bush's total and complete failure was secured. The most destructive president in the history of the United States. Good riddance. When a president loses his cool (panic) and also loses the support of his own party, the country is truly, truly f*cked. We have no competent or credible leader for the next few months. We're on our own. Save the headline and insert "McCain" for a previw of a McCain-Mooseturd Administration. Welcome to America. You've always been on your own. The idea was to get away from Big Brother and do your own thing. BTW you do realize you contradict yourself when you post "no competent or credible leader for the next few months." 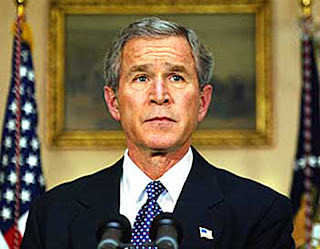 when you've been saying all along that Bush is incompetent, right? That's a common mistake youth make - talking out of both sides of their mouths. Don't worry, you will get better as you age. Then you will feel foolish, then you will wonder who judged you as you judged others, and then you will shut your mouth. Unless you refuse to grow up, and then you should grow a ponytail, get a Harley and a pick-up, and practice that bounce in your walk that you had when you were 20. "We have no competent or credible leader for the next few months." Nothing has changed for the corrupt Republicans. Why do you think they want to do their "insurance plan" for the bail out? So they can say f' you to the middle class and protect these big corporations and CEO pay. We have to be able to read between the lines with these corrupt idiots. They should be all voted out of office but there are too many ignorant Americans out there listening to Rush the Big Mouth Right Wing Whacko. Don't believe me? Watch this. Look at these idiots! And we all wonder why our country is so screwed up. We need to get these corrupt idiots in Congress and Wall St. out of our country. They are already discredited, no one wants to deal with them anymore, and they just brought down the whole world.